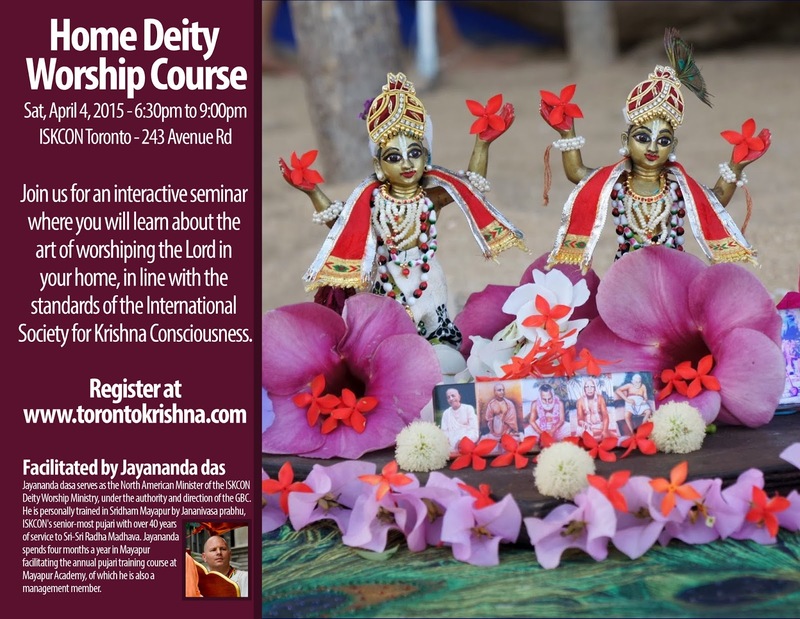 Home Deity Worship Course - April 4, 2015 ~ The Toronto Hare Krishna Temple! One of the many unique and amazing things about the Hare Krishna movement (ISKCON) is the incredible standard of Deity worship which has been established by our beloved founder, Srila Prabhupada. Since the early days of our movement, incredibly beautiful Deities have been "installed" in temples all around the globe. 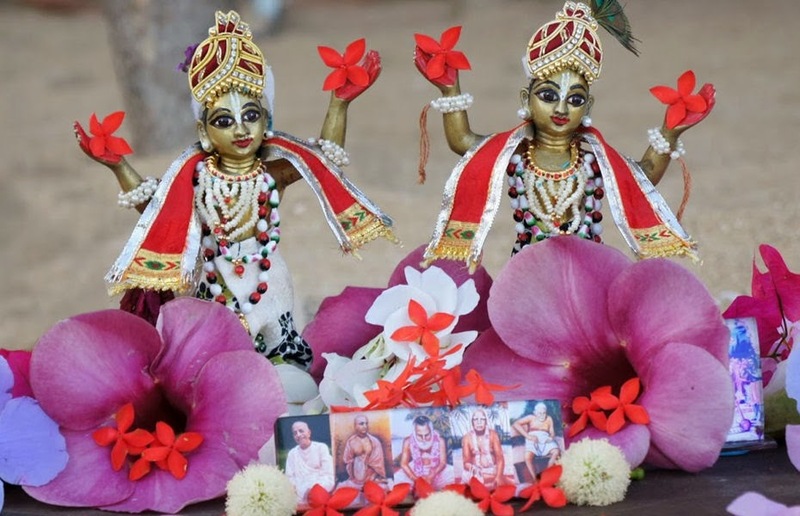 With impeccably high standards, these Deities are worshiped several times a day, given sumptuous offerings and cared for lovingly by highly trained pujaris (priests). The culture of Deity worship is encouraged in the home as well! Many aspiring devotees maintain altars (sacred spaces) at home where they can worship their own Deities. While the standards may not be as high and stringent as those in the temple, devotees are encouraged to worship, with great care, the Lord in their home. In an effort to help our devotee community learn about ways to serve the Deity of Lord Krishna at home, we will be hosting a special seminar entitled, "Home Deity Worship" on Saturday, April 4, 2015 from 6:30pm to 9:00pm. The course will be faciliated by Jayananda prabhu, who will be visiting our Hare Krishna centres around the GTA from April 2nd to April 8th. The one-day course is open to everyone! Jayananda dasa serves as the North American Minister of the ISKCON Deity Worship Ministry, under the authority and direction of the GBC. He is personally trained in Sridham Mayapur by Jananivasa prabhu, ISKCON's senior-most pujari with over 40 years of service to Sri-Sri Radha Madhava and who received personal instruction in deity worship from Srila Prabhupada and was instructed by him to train other pujaris. Jayananda prabhu spends four months a year in Mayapur facilitating the annual pujari training course at Mayapur Academy, of which he is also a management member. Additionally, he performs many additional functions for ISKCON Deity Worship Ministry worldwide as the primary assistant of ISKCON's Deity Worship Minister, Nrsimha Kavaca Prabhu. While in the USA, he is based in the Mid-Atlantic area and travels among ISKCON temples to serve pujaris and leadership by offering training, guidance, and support. To register for the course, please fill out the form at the bottom of this page! We look forward to seeing you there! (Please note, the same seminar will be taking place at both ISKCON Scarborough and ISKCON Brampton on Friday, April 3rd and Sunday, April 5th respectively).